Wancle Sous Vide Machine Review - One Of The Best To Buy? / Wancle Sous Vide Precision Cooker Review – Is It Worth Buying? Wancle Sous Vide Precision Cooker Review – Is It Worth Buying? If I told you that you could buy a sous vide cooker for a cheap price, would you believe me? With the growing popularity of gadgets like the sous vide, manufacturers are catching on and are creating models that can be used at home. This is no surprise since it potentially gives ordinary citizens the opportunity to make restaurant-quality dishes from the comfort of their own home. Wancle is one such company that makes reasonably priced sous vide machines, which will cost buyers less than a $100 per unit. If you compare it to other models, this is definitely a steal—the price is too good to overlook! In this article, I will be discussing my impressions of the Wancle Sous Vide Precision Cooker. If you are in the market for a sous vide cooker or are simply curious, then keep reading. So How Does the It Work? The Wancle Precision Cooker is a type of immersion circulator sous vide. To use it, you have to clip it on the side of a container of water, select the settings, and wait for it to reach the proper temperature before placing the food in the water bath. Using this model is such an easy undertaking. 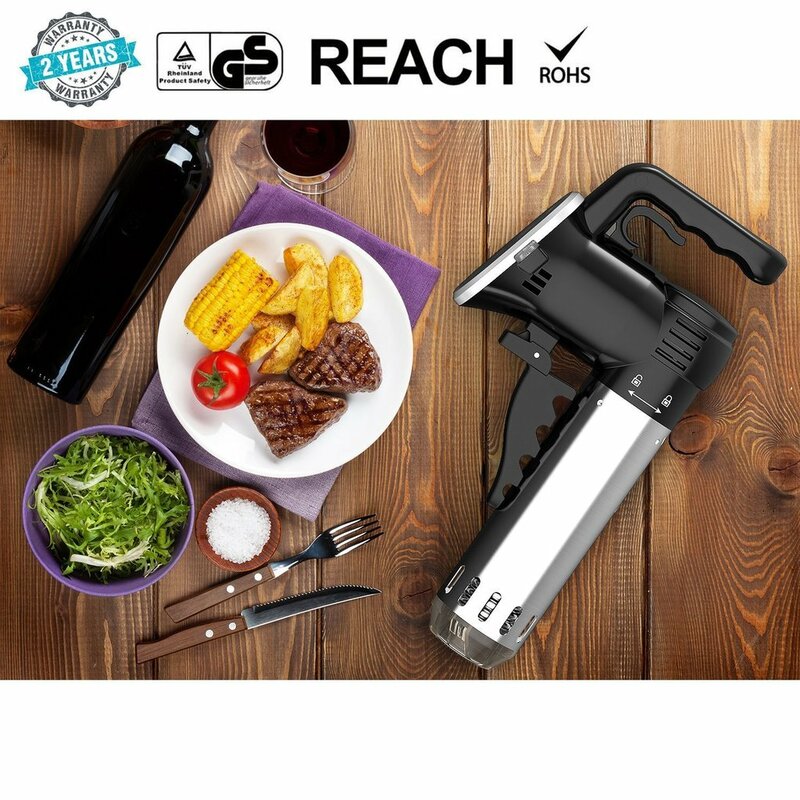 Sous vide cooking is easy as it is, but give how simple the design of the Wancle Sous Vide is, there are even less risks of making mistakes since all that you need is on the device itself. 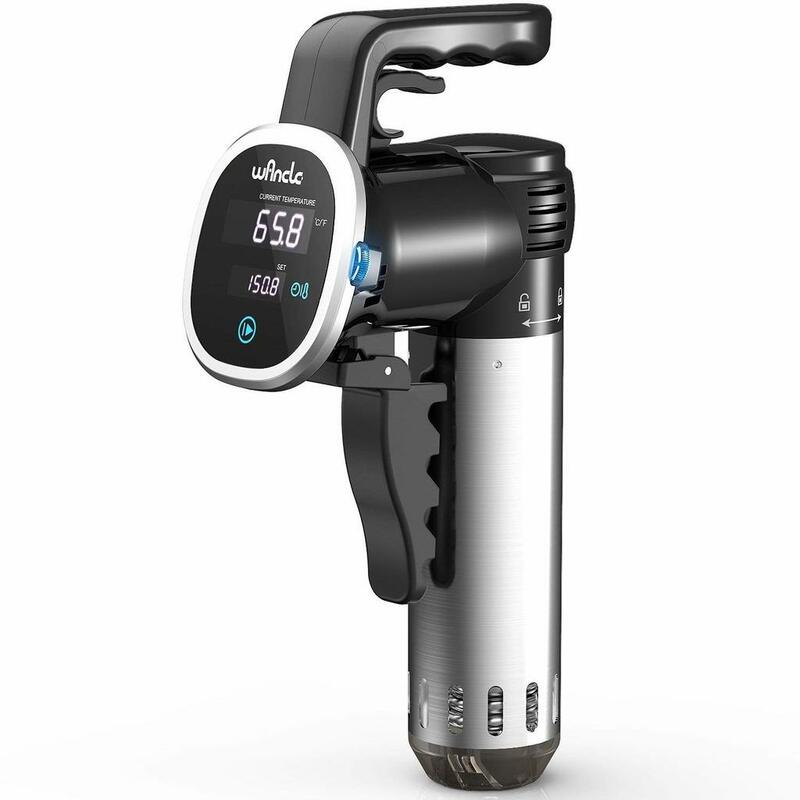 Unlike other models, the Wancle Sous Vide is more pocket-friendly. Even so, I think it is important to still consider it features to make sure that you are getting your money’s worth even if it does not come with a hefty price tag. Like other immersion cookers, the Wancle Precision Cooker has a cylindrical shape, and you are meant to hand place it in a water bath for the sous vide cooking process to take place. It has a clip on the side, to make sure that you can secure it in place. The controls have a touchscreen feature, and do not fog up when the water becomes warmer. However, it also protects against overheating. It is a fairly low maintenance device—the stainless steel body is quite easy to clean and does not make a loud noise while it is being used. Again, it is a simple device, which is why many users prefer it. One thing to note about the Wancle Suvee is that it sticks to the basics. While a lot of sous vide cookers boast of Bluetooth, Wi-Fi capability and app assistance, the Wancle takes it down a notch and simply places the control settings on the cooker itself. No need to rely on smartphones and/or other gadgets to make sure that your sous vide cooker is working – just use the scroll wheel and get it heating in no time. The settings written in the manual and the symbols on the device itself are easy to understand—even new users will need little to know assistance to figure it out! Do not be deceived by the simplicity of the Wancle Cooker. While the manufacturers deliberately chose to focus on the core functions of a sous vide cooker, I can say that it was thoughtfully designed. All you need to do is to attach it to any pot of water you wish to use for sous vide cooking, wait for it to reach the right temperature, then place the sealed food in the water bath. The immersion cooker itself has markings to guide users about the appropriate water level for the optimal cooking experience. The time and temperature settings can be found in the manual and online. The Wancle Cooker’s heater uses a 850W heating element. With a temperature range of 77-220 Fahrenheit, it can heat up the water in about 25-30 minutes. You can speed this up by putting hot water in the container before placing the sous vide. It circulates water well and maintains the temperature consistently, but I would advise you to check on this from time to time. Not having the Bluetooth or Wi-Fi assistance does have its downside. What Types Of Food Can You Prepare? Sous vide machines are popularly used to cook meat. In the case of the Wancle immersion circulators, it does cook steak well too. You can also try cooking other types of food like vegetables and eggs. One of the best things about using sous vide cookers is that it cooks food well and consistently. One of the main reasons why sous vide cookers are popular is that they can cook food to perfection while maintaining its nutritional value. While cooking in this way involves some heat, it only does to the extent that the ingredient becomes edible and flavors develop. There is little to no risk of overcooking and/or burning. Given that you can cook anything using the sous vide, I would be more mindful about mastering the correct time and temperature settings for each food category. Referring to the manual and online resources can help address this concern. The Wancle Precision Cooker can be purchased online on Amazon and in-store at Walmart. I do not have an updated list of stores that offer this model of sous vide cooker, but feel free to browse through Google before heading out. To see how the Wancle compares to the Anova, you’ll have to visit our best suvee cookers comparison and guide that will be linked soon enough. The Wancle Sous Vide is a good basic cooker, it does have its drawbacks. Because it does not have Bluetooth and Wi-Fi capability, you need to be close by while you use this. You need to check on it frequently to make sure that the temperature and water levels are correct. 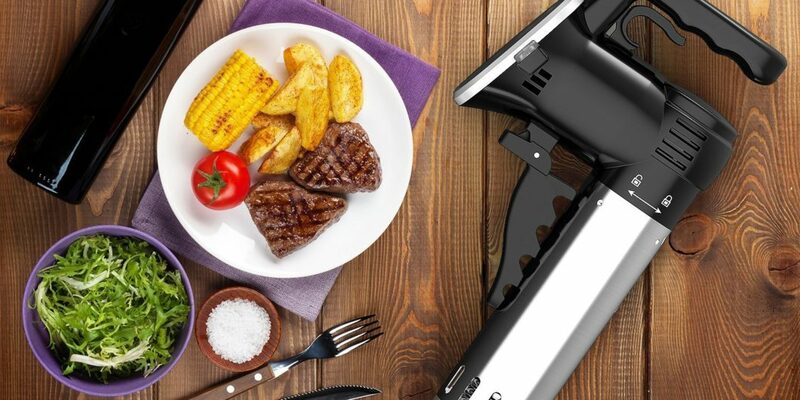 While the Wancle has its built-in mechanisms to make sure that it works well with minimal supervision, not having the Wi-Fi, Bluetooth and app to help out might be an issue, especially for first time sous vide users. I also found that the placement and quality of the clip can be improved. The “teeth” of the clip limits the adjustability of the immersion cooker—if left alone for a long time, it can leave the sous vide cooker hanging at an awkward angle. Of course, with some time and patience, users can adjust to the Wancle Cooker. 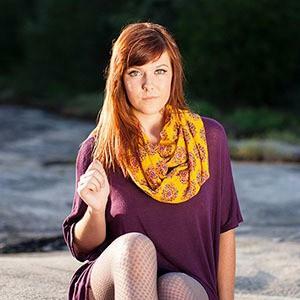 Given my experience with it, I realized that sometimes, value for money may not be a good thing. You have to consider why a premium product would come cheap. Overall, I would say that if you are looking for a budget sous vide cooker, you may want to consider a different option.